shameless…Rep. 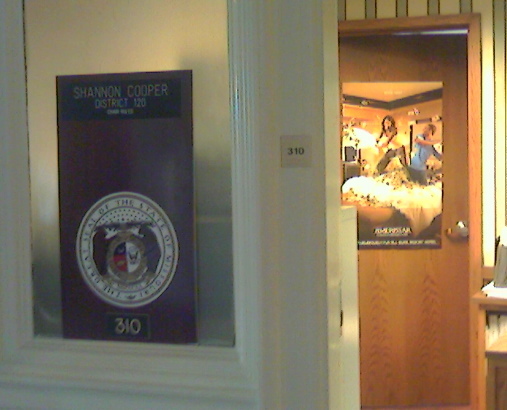 Shannon Cooper never met a casino lobbying gift he didn’t take! Several media outlets, watchdog groups, bloggers, reporters, etc… spend a good amount of time educating the public on particular campaign contributions and lobbyist gifts and there effect on elected officials and the type of legislation they support and pass. Even when confronted with the details of a recent gift or contribution many elected officials simply give the standard answer of their judgement not being affected and continue to happily take the gifts from special interests. However, there is one state representative who not only flaunts the contributions and gifts from gambling special interests, he fully expects to receive what he wants, when he wants it. After all, he is working hard to keep the casino industry happy. This elected official is none other than Rep. Shannon Cooper. He is among one of the largest recipeints of campaign contributions from the casino industry and has a social calendar filled with gambling special interest funded trips, hotel stays, concerts and more. Rep. Shannon Cooper is among those headed to St. Louis tonight for the sold-out Jimmy Buffet concert at the Verizon Wireless Amphitheater. Cooper, R-Clinton, said he got a complimentary room for the night at the nearby Ameristar Casino hotel. “Of course they got me a room,” he said. Cooper said his ticket was free but he can’t remember who gave it to him. If Ameristar wants to give me a room, I’ll take it. If someone wants to buy me tickets to a concert, I’ll let them. I don’t ask that often. By all accounts, the performance given by country music legend George Jones June 10, 2007, at the Ameristar Casino in Kansas City was a rousing success and Rep. Shannon Cooper, R-Clinton, had eight tickets to that event, worth $440, courtesy of lobbyist Betsy Morgan. May 9 was a big night for freebies for Shannon Cooper. He accepted five Kenny Chesney tickets worth $345 from Stephen Knorr, University of Missouri lobbyist, and $343 in travel and lodging from Ameristar Casinos lobbyist Jorgen Schlemeier, though Schlemeier only attributed a part of the cost to Ameristar, since it was the last day of the legislative session, it appears Cooper did quite a bit of celebrating. Cooper also took a cruise provided by Ameristar Casinos lobbyist Sarah Topp during the National Conference of State Legislators in August. Two days before Rep. Shannon Cooper, R-Clinton, submitted a bill to remove the loss limits for Missouri casinos, he may have been conducting some in-person research at one of those facilities. Documents posted minutes ago on the Missouri Ethics Commission website indicate Cooper, whose bill would also limit the opening of new casinos in the state, thus lessening competition for those already here, had $771.17 for “hotel accommodations” paid for by Matthew Clark, lobbyist for Ameristar Hotel and Casino in Kansas City.